A trip to Patagonia would not be complete without a visit to the Paton Center for Hummingbirds. Dedicated to the celebration and conservation of hummingbirds—and all of southeast Arizona’s astounding biodiversity—through recreation, education, and sustainable living. Wally and Marion Paton first began inviting birders into their yard shortly after moving to Patagonia in 1973. They eventually put up a canopy and set out benches, bird books, and a chalkboard for people to record their sightings. The Patons had a special vision for supporting their backyard birds with an array of feeding stations—and supporting the wider birding community by sharing the riches of their yard. After Wally passed away in 2001 and Marion in 2009, the birding community was left with an inspiring legacy upon which to build. 212 bird species have been reported for this cozy home lot on the outskirts of the town of Patagonia, including Violet-crowned Hummingbirds, Thick-billed Kingbirds, Gray Hawks, Varied Buntings, and many more local specialties. This amazing diversity results from our location in an ecologically rich and healthy corner of the state. Surrounding the Paton Center you will find: The Nature Conservancy’s Patagonia-Sonoita Creek Preserve, the Patagonia Mountains (one of Arizona’s newly declared Important Bird Areas), the San Rafael Grasslands, and the Sonoita Plain. We must preserve these natural heritage treasures if we are to preserve the birds of the Paton Center. The Richard Grand Memorial Meadow is a new addition to the Paton Center for Hummingbirds—a lovely, open field with dense vegetation bordering its south side and trees ringing the rest of its periphery. The meadow itself is being carefully planted with a variety of native plants to attract birds and butterflies by naturally providing food sources including nectar, berries, and seeds. A small water feature has been provided in the interim as a larger pond is being constructed. The pond will offer enormous benefit to local wildlife—and visitors eager for an intimate glimpse of southeast Arizona’s striking biodiversity. The lives we live can support the birds we love. 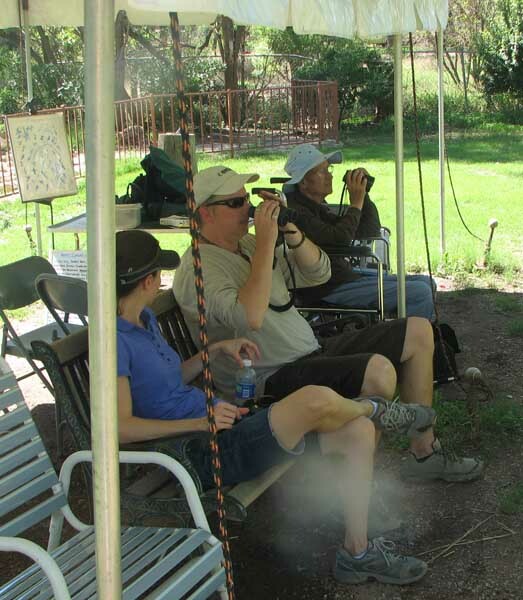 One Saturday per month, Tucson Audubon’s Paton Center for Hummingbirds will offer two separate activities in Patagonia. You are invited to attend either or both…. October through April. 1. HIKE: The day’s events begin early with a guided bird and biodiversity hike to hidden corners of the species-rich country surrounding the Paton Center. 2. LEARN: Following the morning hike our Relaxed Lecture Series will provide informal discussions on a variety of topics regarding the natural history, ecology, and conservation actions of southeast Arizona.